Brave, cunning, and adaptable, humanity dominates the countries of the Inner Sea. 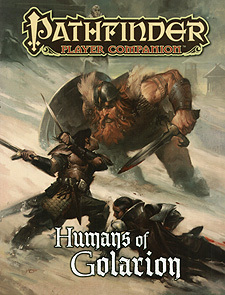 Discover the legendary history and secret ambitions of humankind, the most populous race of the Pathfinder campaign setting. With the potential to do anything they set their minds to, humans have become unrivaled heroes, infamous villains, and even deities - and now the course of humanity's future is in your hands. Learn of the varied and distinctive ethinicities, of humankind, from rugged Ulfen vikings and scheming Chelish diplomats to noble Garundi travellers and mysterious Tian merchants, and master the unique skills and traditions they use to face the dangers of a world that refuses to be tamed. Information on the physical traits, philosophies, traditions, histories, and cultures of humans - the most populous race in the Inner Sea. Insights on each of Golarion's major human ethnicities, designed to help players create distinctive and exciting characters ready for any adventure. A detailed map charting the historical migration for the most common human ethnicities in the Inner Sea region. Revelations about Aroden, the fallen god of humankind. Notes on the lost empires of humanity, such as Azlant, Thassilon, the Jistka Imperium, Ancient Osirion, and more. New traits, spells, and weapons for each human culture.